Beech is almost identical in hardness (under 1% harder) to Red Oak, which is the benchmark of the Janka scale. Flooring is normally made from one grade lower of lumber. Thus, #1 Common lumber will make Select and Better flooring and so on. Lumber is graded worst side, while flooring is graded best side of the board. The lumber is defected to yield a higher grade of flooring, except when Clear grade flooring is made. Beech is usually only available in two grades because of the relative scarcity of the lumber. Other grades are available from time to time. Select and Better Beech flooring is color-sorted to remove knots, mineral streaks, and surface defects such as cracks. Slight color variations from yellows to tans will be present. 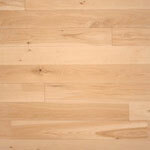 #2 Common Beech flooring includes all the character found in the wood. Large knots, light yellow sapwood, dark heartwood, worm holes, and other surface defects are included in this grade. Other common names are Rustic Beech, Mill Run Beech, and Tavern and Cabin Grade Beech.